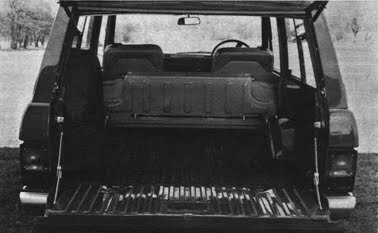 British Leyland believe so, as they in these days launch a 'Land-Rover in Tuxedo', which means in addition to the regular Land-Rover chassis, the vehicle have a new kind of vehicle body design with soft lines and much more comfort than the box-shaped original. If that is not enough; the Buick-V8 engine have been installed as the source of power. The equal V8 as used in Rover 3,5 and was taken over from GM for a few years ago. driver can select either rear wheel drive or drive on all four. 2 adults the capacity increases to 550 kg. The producer allows a towing capacity of 1.800 kg. 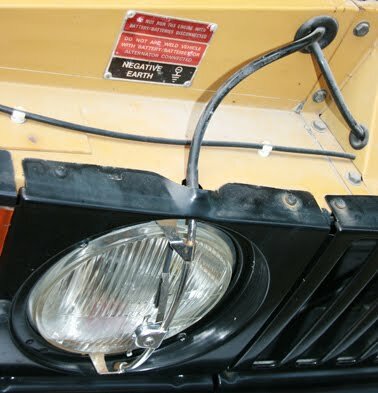 The vehicle is with two circuit brake system and servo assisted disc on all four wheels. The 4-speed gearbox is combined with a reduction transfer case that increase the total gears to eight. is not clear, but a petrol driven Land-Rover today have a price of approximately 23.000,- SEK. The Range Rover is likely to be higher priced. companies' with Joint Managing Director; Mr. Gunnar Eik responsible for both companies. 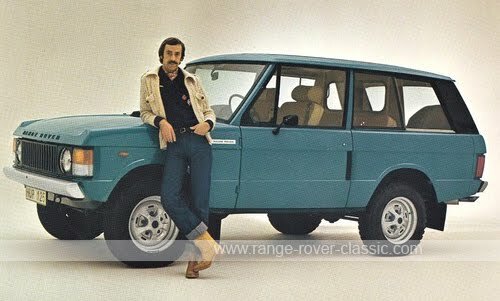 Range Rover was launched in Norway in October 1971 and in Sweden the Range Rover was launched in March/April 1972. 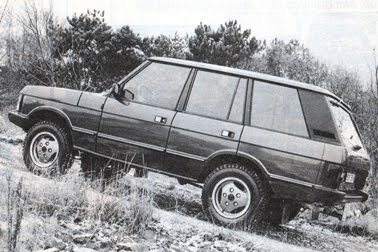 The build records show the first 2 Range Rovers exported to Norway was chassis number 35800018A and 35800019A. These vehicles were in Lincoln Green colour. The first was built 14 May 1971 and the later on 19 May 1971. Both were dispatched to British Leyland Norway on the 20 May 1971. 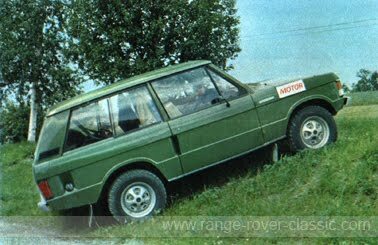 The Range Rover 35800018A and 35800019A was imported to Norway as demonstration vehicles for British Leyland Norge A/S. 35800018A was registered in Norway on 3 September 1971 and has survived close to complete with most of its original parts intact, included the original engine and the Palomino vinyl interior. It is under restoration by this website owner. introduced in Sweden in the second half of 1972, one year after the launch in Norway. with the greatest probability the first registered in Sweden, too. British Leyland Sweden AB and ambulance coach builder Heinels Verkstads AB in Malmö, Sweden cooperated during autumn in 1972 to develop an ambulance suited for use under Nordic conditions with often long distances, remote areas to rescue and have the best possible features to operate under the most difficult weather conditions during the Nordic winters. 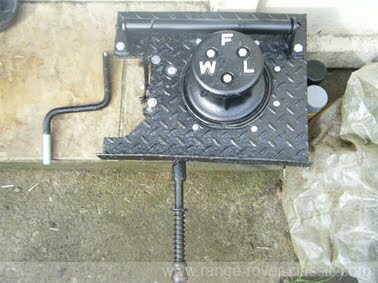 The solution was a very clever 36" (100 cm) extension of the frame to get a 136" wheelbase vehicle. The result was an ambulance with extra-ordinary superb driveability due to the long wheelbase and the low weight balance. 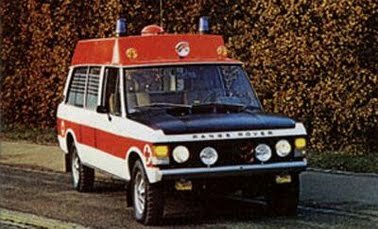 The Range Rover Heinel ambulance got addition of 2 extra rear doors, which actually was original front doors, raised roof in fiberglass, one-piece top-hinged rear door, different options of interior to suit customers purpose of ambulance transportation needs. Comfortable Recaro front seats was installed for best possible work condition for the drivers. at Solihull in UK, for evaluation and approval. 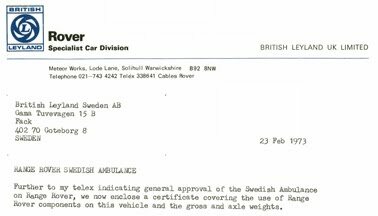 In February 1973, Rover - Specialist Car Division at BLMC issued a certificate that approved the Range Rover Heinel ambulance. BLMC also issued 2 official press photo's telling that the ambulance was approved. 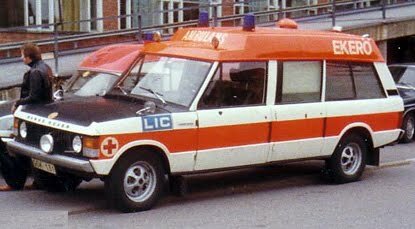 British Leyland Sweden marketed and sold the Heinel ambulance to customers in Sweden and Norway. Some few ambulances were also sold to other countries. Total produced number is not possible to get, but 35-40 Heinel ambulances looks to be the most correct number. now restored and well kept. Range Rover is the premium class vehicle that became too popular in Sweden. expensive in Sweden and had then a price level of SEK 74.900,-.
in Sweden even today of vehicles from 1972 and 1977/78. of VAT. 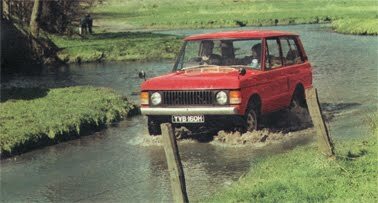 Range Rover was occasionally imported by private persons or by individual firms in fairly low yearly amount. became then above the limit and a whole new market occured as company customers could register the Range Rover as Light Truck and withdraw the VAT.